With the nightly news saturated with reports of war and some exciting records recently uncovered pertaining to American Civil War kites, I thought it would be appropriate to explore the use of kites in military applications over the course of history. For most of the examples below, we have indisputable proof that certain kites were indeed used for military purposes. Some of the historical military kites are currently in museums and private homes. Often, there were official war department photos, communiqués and even operating manuals. just like the recent authentication of the use of kites in the American Civil War (see below). This is far from an exhaustive compilation on the subject. Instead, it should be considered more of a sampling, a starting point. China 202 BC ~ B. Laufer writes in his book, The Pre-History of Aviation, of a General from the Han Dynasty, who, when his troops became cornered, devises a method of attaching Aeolian strings to a kite, so when flown under the cover of darkness over the enemy camp, the sounds emitting from the kites were thought to be warnings from the gods, petrifying the opposing army and causing them to flee. Korea 600 AD ~ The Samguk Sagi, written in 1145AD recounts how General Gim Yu-Sin (596  637 AD) was asked by Queen Zindong (28th Ruler of the Silla Dynasty) to quell an uprising of rebels. While the General was pursuing his orders to squelch the rebellion, a shooting star fell. This was an exceptionally bad omen to both the rebels and Gim Yu-Sins troops, causing heightened anxiety to all. 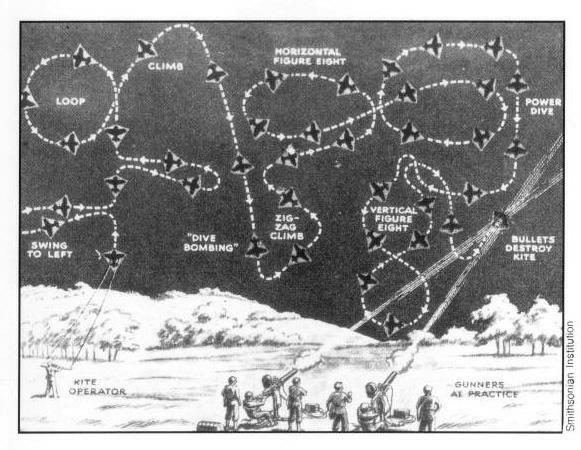 Calm and peace were restored when the General got the notion to lift a fireball (lantern) up into the night sky using a large kite. Thus, he convinced everyone that the shooting star had returned to the heavens and disaster was adverted. China 1232 ~ According to Science and Civilization in China, J. Needham wrote that in 1232, the Chinese used kites for psychological warfare. Kites were used to drop leaflets into a compound that held prisoners. The leaflets incited a riot that led to the prisoners escape. India 1659 ~ As depicted by Bill Thomas in The Complete World Of Kites, the kite played an important role in an early territory battle between the Hindus and Muslims. A young Shah named Shivaji used a kite to get a line across a chasm near Poona. Under cover of darkness, kite line was replaced by rope and Shivajis men were able to scale the wall of the fortress and overtake the guards. Russia 1855 ~ Admiral Sir Arthur Cochrane devised a method for kite use during the Russian War of 1855. Using twelve-foot kites, Cochrane towed torpedoes to a target. Even though the trials were very successful, their practical use was not. Prevailing winds and moving targets proved to be formidable obstacles. England 1893 ~ Captain B.F.S. Baden-Powell designed a stack of six large hexagonal kites for the British that were used in the Boer War in South Africa to lift soldiers into the air to observe the enemy. Captain Baden-Powell also did a series of tests using kites to carry messages from one ship to another. 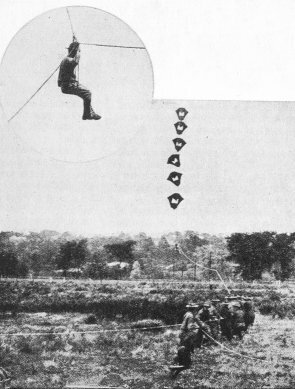 United States 1896 ~ US Army officer Lieutenant Hugh D. Wise successfully worked out a system to lift a man using Hargrave box kites. It was planned for use in the Spanish American War for enemy observation, but the location and deployment of troops was learned by another means. Unfortunately, the airplane soon made the system obsolete before another opportunity could present itself. England 1901 ~ Samuel F. Cody patented his kite system of man lifting and gave a demonstration to the War Office in December of 1901 for use in military applications. The Admiralty allowed trials on warships during 1904 & 1905. The War Office adopted the system in 1906 for Army observation. 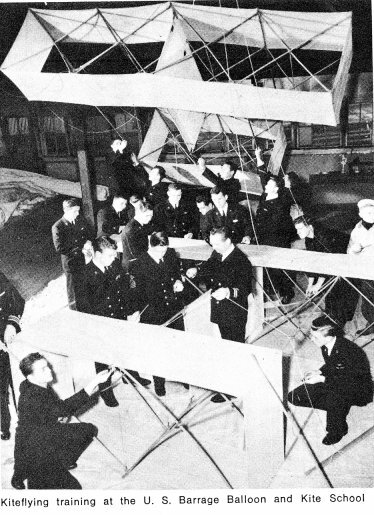 Cody was given Officer status with the post of Chief Kite Instructor at Farnborough with orders to design and manufacture kites and give instructions in their operation. Russia 1903 ~ Lieutenant Schreiber of the Imperial Russian Navy was also experimenting with a man lifting system using a Hargrave double box. His system was abandoned after several fatalities proved it unstable. Captain Ulyanin of the Russian Army developed a train of double Conyne kites that achieved the lift they were looking for. France 1909 ~ Charles Dollfus held a competition to determine the most suitable man lifting technique to be considered by the French Military Authorities. Captain Madiot won the contest with a winged box kite system. Captain Madiot died in an aeroplane accident a year later and the French Army adopted Captain Saconneys man lifting system. 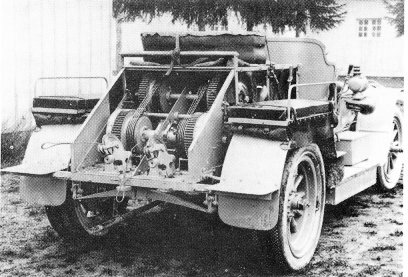 Saconneys kite-corps contained a motorcar, trailer, and a winch that was driven by the cars engine. The system was also installed aboard the ship, The Edgar Quintet, in 1911. Germany 1914 ~ During World War I, Germany designed a folding box kite system, facilitating their use as man-lifting devices compact enough to store aboard their submarines. After launching the kite, a basket with its occupant was hauled up using a man-powered winch. United States 1915 ~ Samuel Perkins researched man-carrying kites for observational uses by the U.S. Army during World War I. He used kites that were nine to twelve feet high in trains of three to six. Perkins work never passed the trial stage. England 1940 ~ The British Admiralty introduced a barrage kite to protect Naval Destroyers. The Hargrave double box kites were adorned with suspended wires or dangling bombs as a deterrent to aerial enemy attack. United States 1941 ~ The Barrage Balloon and Kite School was opened in New York City. Sauls barrage kites were flown on wire lines and capable of shearing wings, which was very effective against enemy dive-bombers. Canisters of explosives were attached to the piano type wire used to fly the kites. At one time 3,300 of the Sauls Barrage kites flew from the sterns of Merchant ships carrying cargo from the United States and Canada to Europe. Germany 1943 ~ The Focke-Achegelis F.A. 330 was invented by aircraft expert Dr. Henrich Focke. It is a rotating wing or gyroplane kite that is highly maneuverable and obtains lift from submarine traction. 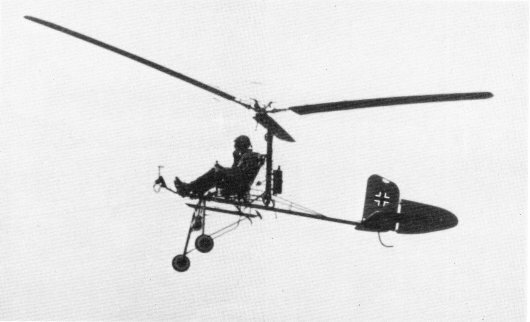 The kite has a set of rotating blades supporting an observation chair. It could be assembled in seven minutes, taken apart in less time, and obtained a height of fifty feet. United States 1943 ~ Commander Paul Garber of the U. S. Navy developed a target kite that could simulate maneuvers of an airplane to provide a moving target to enhance the training of aircraft gunners. 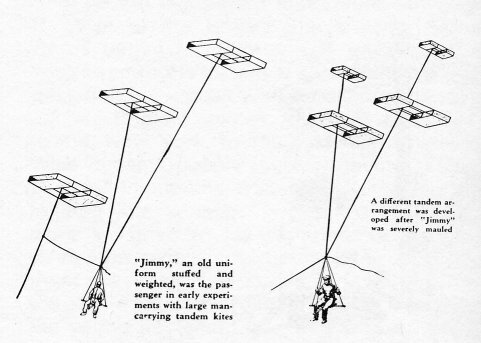 Garber also used signal kites to pass important messages from ship to plane. A cable with the package of papers attached to it, was strung between two kites, the airplane flying overhead would catch the cable with a long hook. United States 1943 ~ American Servicemen had life rafts with special radios for use by shipwrecked crewman or downed aircraft. A box kite that served as a spotter and radio antenna was designed to work with a hand-cranked transmitter as a lifesaving rescue device during World War II. This device, called the Gibson Girl, was in use up to, and including, the Vietnam War. It was eventually made obsolete by the invention of cell phones. This partial list of the use of kites in military applications is merely a starting point. My ultimate goal is to compile a thorough and accurate chronological kite history timeline for the AKA. It would certainly be valuable and useful to everyone, especially educators. I ask your help in this task. Please keep your eyes and notebooks open. Make sure you get those references, and I will let you know in the near future where you may send your contributions. Thank you!